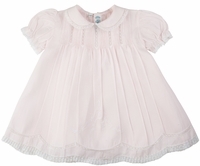 This darling little pale pink cotton blend smocked baby dress is made by Feltman Brothers, a top designer of quality baby garments. It features a beautiful yoke with rows of tiny pintucks and bands of lace insertion. This elegant little dress has a lace edged and embroidered Peter Pan collar and short puffed sleeves trimmed with lace. A double row of scalloped lace below an embroidered floral spray finishes the dress, which closes in the back with two small buttons. The matching slip can be worn alone as a slip dress in the summer. Note: Dress is not as transparent as image on left appears. Photo is backlit to highlight beautiful lace and embroidery. See pictures below. Note: This sweet little dress is also available in white. See below.